Sarah Irvin creates artwork at the intersection of the social construct of motherhood and her own lived experience within the daily practice of mothering. She is interested in public perceptions and definitions of caretaking and how these definitions influence the caregiver as well as those they care for. Through the Child Citizen project, Irvin tracks her daughter’s development as a global growth chart. 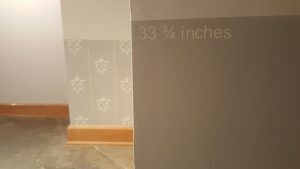 She marks her daughter’s height in public spaces using paint that matches the color of her daughter’s bedroom. 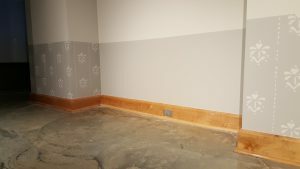 The project changes as she grows, as the family moves to a new home or repaints her room. By denoting the ever-changing height of a child, the project is a declaration of her presence within public space as an active participant in public life. The project calls attention to society’s influence on a developing person over the course of their lifetime and highlights the individual’s impact on society. 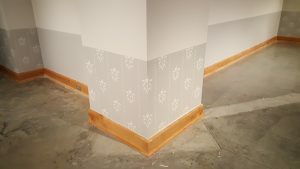 For this iteration, Irvin marked her daughter’s height the day of installation and incorporated the wallpaper pattern from her dollhouse as a texture on the wall. 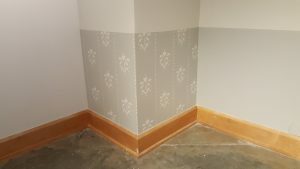 By using a pattern found in her daughter’s domestic environment of play within the Child Citizen project, Irvin further conflates notions of public and private. 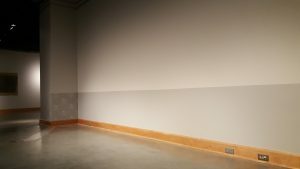 The work calls the viewer to consider how the passage of time within the space of home and the public realm impact the individual and how this individual then impacts these spaces.